This summer, take on the Doritos HeatWave for a chance to win hot prizes. 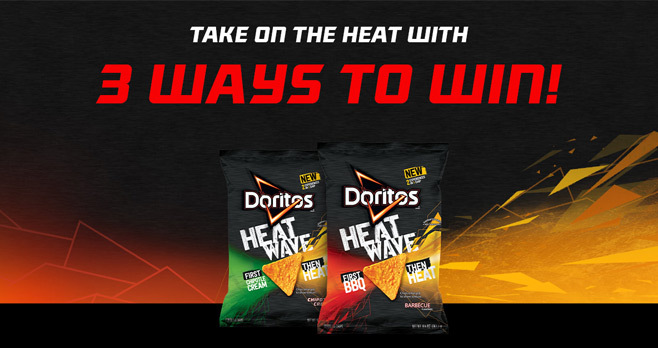 Grab a bag of Doritos HeatWave BBQ or Chipotle Cream, and enter your bag code online at DoritosHeatWave.com and play the Doritos HeatWave Instant Win Game. You could instantly win Doritos brand tumblers, t-shirts, and noise-canceling headphones. Plus, one lucky grand prize winner will win an Hawaii Volcano Trip for two. Enter Your Bag Code: Purchase any 3 oz. or 9.25 oz. bag of DORITOS HeatWave BBQ Flavored Tortilla Chips or DORITOS HeatWave Chipotle Cream Flavored Tortilla Chips and look for the code located below the “guaranteed fresh” statement on the front of the bag. Upon obtaining a Bag Code, visit www.doritosheatwave.com and follow the on-screen instructions to register and input your Bag Code to play for a chance to win a prize. Scan Your Bag: Purchase any 3 oz. or 9.25 oz. bag of DORITOS HeatWave BBQ Flavored Tortilla Chips or DORITOS HeatWave Chipotle Cream Flavored Tortilla Chips. Next, visit the www.doritosheatwave.com and follow the on-screen instructions to register and scan the front of your Bag with a mobile device to play for a chance to win a prize. Create Your Gif: To play without making a purchase, visit the www.doritosheatwave.com, register and add a custom filter or sticker to your Twitter or Facebook profile image and share the new image via the Web Site to play for a chance to win a prize. Grand Prize (1): Trip for winner and one (1) guest to Hawaii. Trip consists of round-trip coach air transportation (from major airport nearest winner’s home) to Hilo, Hawaii, double-occupancy hotel accommodations for two (2) nights, two (2) tickets for a tour and hike on Kilauea volcano, and $300.00 spending money (awarded in the form of a check, payable to winner). ARV: $4,000.00. First Prize (100): One (1) pair of Thematic Beats Headphones. ARV: $245.00 each. Second Prize (230): One (1) DORITOS Branded 20 oz. Yeti. ARV: $39.99 each. Third Prize (1,000): One (1) DORITOS T-shirt, size Large. ARV: $7.60 each. The Game is open only to legal residents of any of the 50 U.S. states and the District of Columbia, who are 13 years of age or older at the time of participation. Begins at 12:00:00 p.m. (noon) CT on May 22, 2017 and ends at 11:59:59 p.m. CT on July 21, 2017. Limit 3 Game Plays per person/email address or social media account or household per day, regardless of entry method. For a list of winners, send a self-addressed, stamped envelope to be received by August 9, 2017 to: Doritos HeatWave Instant-Win Game, Winner’s List, 10 South 5th Street, 7th Floor, Dept. 876-760, Minneapolis, MN 55402. For complete details, including Official Rules, visit www.doritosheatwave.com.